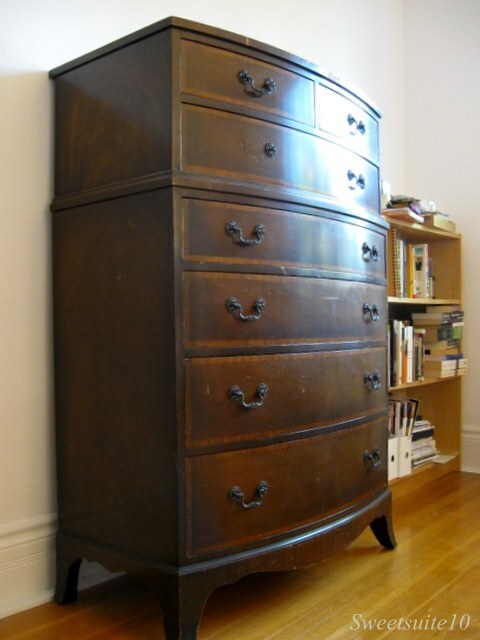 For quite a while I've been looking for a new dresser for my bedroom. 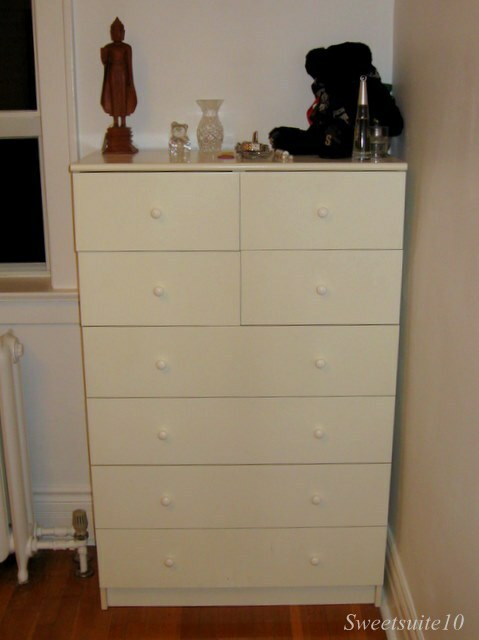 I currently use a white Ikea dresser that I've had since, well, I think I was in middle school when it was purchased. Most of you don't know my age, but trust me when I say - I've owned it a LONG TIME! The dresser was $25, and since I don't have a vehicle I negotiated, and the sellers delivered it for an additional $25. I'm pretty pleased with my purchase, but it's been sitting in my living room for months as I debated what to do with it. You see, the dresser is a little damaged - it's got some missing veneer along the top edge, and it's got some other scratches and marks. 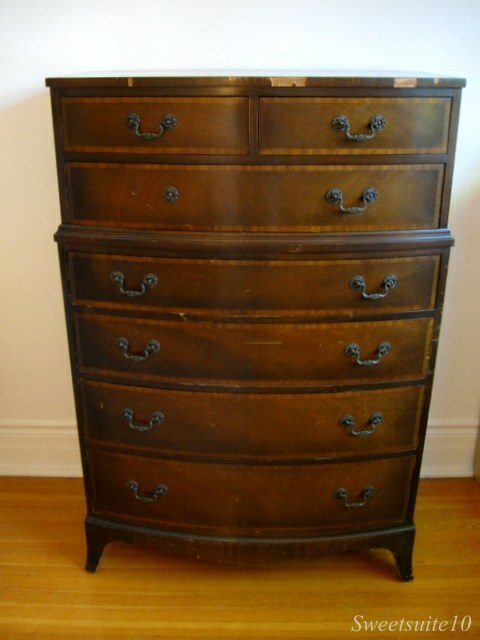 Other than its surface defects it's a nice dresser - it's got a great shape and the drawers have dovetailed joints. I know it's really popular right now to take old damaged furniture and paint it a great colour, but I love the look of the old wood, and I'd rather like to try to save it. My conundrum is I've never done anything remotely like this before and I'm honestly terrified to try. In my head I know if things don't turn out well I can always paint it (I even know I'll probably paint it Kelly green if worse come to worst), but I want it to be a successful makeover so badly I keep second guessing myself and my ability to pull something like this off. So, what should I do? Should I try to repair the damaged veneer on the front, and then strip the old varnish off before re-varnishing? Or should I just peel off the rest of the damaged veneer strip, sand it down and cover it in green paint? Either way, does anyone have any tips or suggestions? Neither. Use a wood filler to fill in the gaps in the veneer, and then lacquer over with a dark finish to create a hard protective surface while preserving the grain. first of all, the piece is an amazing find even with the charge for delivery! i've never been successful with staining over wood filler but it's worth a try. if that doesn't work, would you consider painting the outside and keeping the beautiful drawers stained? lots of that going on in bloggyland now and it's lookin' fine! best of luck! let me know when it's finished! I don't have any answers..... but wanted to tell you I think that is a pretty piece of furniture. Congrats on the craigslist deal! Funny, we're in the process of refinishing an old veneer dresser, too! And I was just scoping out craigslist for another dresser when I stumbled onto your post. Small world. We've never had good luck with wood filler and stain. You could re-veneer it, but that's a pretty major undertaking. If you do decide to paint it, try oil-based paint instead of latex. It's sooo much more durable for furniture. Either way, awesome find for 25 beans! Agreeing with Amy! The details on the drawers is really nice. 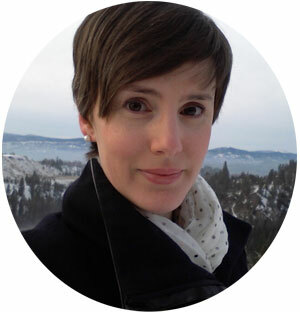 The FFF posts are really helpful - lots of great ideas. The body of this piece would be perfect for some chalk paint and distressing (there's even a bright green :-). Don't fight the damaged areas, let them work for you! Don't forget to post your finished piece!! Found your link over at Miss Mustard Seed. I've not ever done anything with veneer, but I've heard that you can remove it with a hot blow dryer or heat gun and a metal scraper, carefully scraping it away as you go and then you can just work with the wood surface underneath, unless it's that layered wood. Then maybe you could paint that edge in some accent color like black or a dark brown stain before sealing. You'd need to sand it well first before staining, etc. Good luck! I'd probably find a good marker & darken the area where the veneer is missing. I might even use more than one color of marker to make it more like the surrounding veneer. I love this piece & like you, would want to keep it as original as possible. Good luck with this & please repost when it is completed. Saw your post at Miss Mustard Seed. 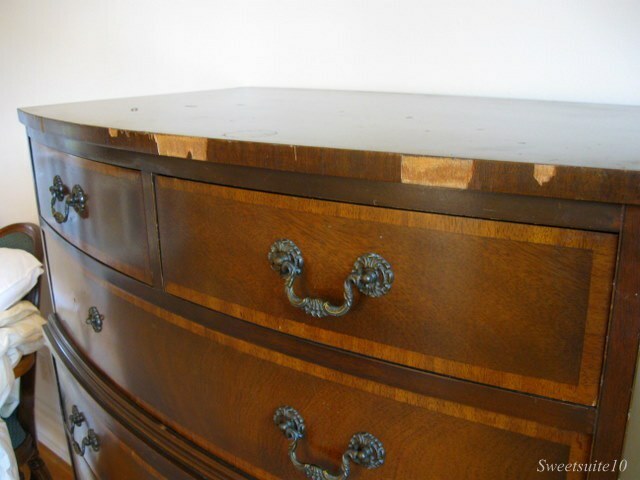 Love your dresser; it's gorgeous. I've never repaired veneer or refinished one but here are a couple of posts that might be helpful. Take your time finishing. You can do it and I hope you'll post your finished piece. You can buy strips of pressure-sensitive or iron-on veneers at www.rocklers.com. Search for "veneer" and you'll go right to the listings. There are plenty of how-to links for repairing veneers on the web, and your library probably has some good how-to books as well. Books from Taunton (publishers of Fine Woodworking magazine) are usually very detailed and helpful. Since you have possibly just that one strip to fix, you might want to give repair a try, before you settle for paint. Small pieces of replacement veneer can be cut out with an exacto knife and used to fill in where you have missing bits. Whatever you do to repair the veneer can't help but improve the surfaces you have to work with if you do decide to paint later on. Good luck - you have a nice piece! I love the dresser! What an awesome deal. I definitely fall into the painted furniture camp... so I wouldn't be sad to see your dresser Kelly green. But I'm really interested in swing what your solution for the veneer will be. I'll be following along to see what the final revamp will be! Nice find! As Beth M explained, you can remove the rest of the existing veneer trim with a heat gun. Please refer to an old post I did showing the removal of veneer (http://www.thediyspot.com/2010/05/a-dining-room-table-tale-take-two/). You can purchase replacement oak veneer trim from Lowes. I not sure what type of wood your dresser is but you can stain the veneer to match your dresser. I'm not sure if Home Depot carries this product. Also, Van Dykes Restoration's catalog carries it as well. If you have any questions, feel free to email me. Good Luck!